Everyone across the internet is getting fed up with these pesky spam bots ruining our Google Analytic data for our websites or client sites. If you are not familiar with this problem, basically in “non-geek speak”, certain websites are using faking out Google Anayltics into thinking they are visiting your website hundreds if not thousands times a month. This is causing websites traffic to spike, which is normal conditions, would be great for us, but this is not. These sites are certainly not sending targeted clients or customers and are wrecking out data. My first attempt to rid GA of this data, was to block these sites from visiting our website through my htaccess file. This works, though in my experience, once they realize you are block one domain, they will just use another. Also, while this will prevent future data from occurring from those sites, it does nothing to remove them from your historical data in GA. Instead my solution for the sites I own and manage was to setup a custom filter, removing all traffic based off of geographical location. Now, if you are an international company, this will most likely NOT be an ideal solution for you. however, my clients only care about traffic coming from the U.S. and occasionally, Mexico. 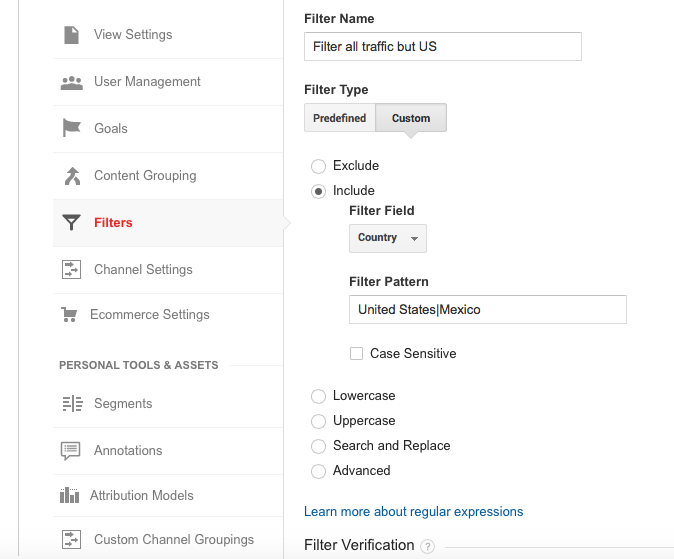 You can setup custom filters by going to Admin > Custom > Filters in Google Analytic’s. Basically, I was getting spam traffic from roughly 5-6 main countries, but, any traffic other than US & Mexico is irrelevant so instead of creating a list of the countries I wanted to exclude and then have an issue down the line when they start visiting from other countries as a work around, I elected to instead just include traffic ONLY fro US & Mexico. See my settings above to duplicate. Please Note: If you do have international traffic, but not in the countries the ghost spam is coming from, you can use this tactic, but instead of including only US traffic, you can create a list of the counties you do get relevant traffic from, or if it’s shorter, you can do the opposite and just exclude traffic from the countries the referral spam is coming from. Anyways, hope this helps as a temporary fix to this problem. Like others, I am hoping that before too long Google comes up with a fix of their own. What!! Shelly, you can’t be serious! You know very well that backlinks play a large part in Google’s Algorithm. We can’t just stop building links. Our rankings will drop like crazy. Or maybe they will skyrocket. Yes, I know how very important having backlinks is to your website and its rankings. But I am here to tell you, you need to stop link building. More specifically, you need to stop TRYING to link build. It’s gotten to the point that practically everything we do online is now being done with the sole purpose of getting a magic backlink. The effect? Not good. Our content and online efforts have dramatically suffered in quality and originality. The legal industry in particular, is a major offender of this. I skip over 99% of the content, posts & tweets that come from Lawyers or Law Firms because they look like nothing but spam to me. I also know very well that this content is most likely coming from a very misguided SEO person or company and not from the actual law professional. Eventually all of the link building tactics we seem to discover become overused and will stop working or even cause penalties. That is not a way to future proof your business online. Take for instance Guest Blogging. What started as a seemingly white hat content building technique caused tons of content producers and content publishers to suffer penalties. Ann Smarty, founder of My Blog Guest was recently interviewed on Bright Local and spoke about how her company was penalized by Google as well as many of the people and companies using My Blog Guest. I have so much respect for Ann, as do most of us in the SEO industry. When she first launched My Blog Guest, I was immediately impressed with the concept and what Ann was trying to accomplish and quickly joined to check it out. However, I quickly realized that while the concept was impressive, the actual content being produced and the website publishers were not. Most appeared spammy or low quality and the content being written was obviously created at the sole purpose of building links. I was very disappointed that such a great idea had become polluted. I do hope that one day, the community returns to the original intent. I would most certainly use it if it did. With the very public knowledge that guest blogging for the purpose of link building is considered unacceptable and a huge risk, I am still seeing companies using this tactic. Today, while cruising the job board at Problogger, I noticed this job request for “Need Guest Blogger To Post On High Traffic Housing/Home Improvement Sites” while there is a slight possibility this anonymous company will require its hired authors to “no-follow” these links (I highly doubt this) this posting to me appears as a paid link-building tactic poorly disguised as paid writing gig. Looking to pay for quality guest posts on high traffic websites related to the housing industry. You will need to be able to post your own blog on the site with a link back to our site. Paying from $20-$50 per article depending on the specifics. Please include a link to places you would be able to place the article with a link back to our site and any additional information why we should choose you for the job. I know you are probably wondering, if we stop trying to link build then how are we supposed to get links and have great rankings? We go back to a not so original concept……..Marketing and Brand building. Start taking the time to develop original & helpful content. Spend the extra time to contribute great content to popular industry websites, but stop expecting backlinks in exchange. Get out there on social media and (here’s another not so original concept) actually network and share your knowledge with the masses. Guess what? Stop worrying about getting links and focus on contributing online and the links will come naturally. Maybe the blog or news site that publishes your article won’t include that link to your website but if you actually took the time to write quality content, others will talk about it, link to it, and they might just link to you. In fact, people are more likely to share the link love when its not expected of them. So quite possibly this concept will cause your link profile to skyrocket, organically. Which is exactly what Google has been trying to get us to do all along.